Air conditioning system will not turn on. A very common event in the first weeks of warm weather when you turn on your HVAC system on to cooling for the first time. As bad as it sounds it’s usually nothing too serious especially if you had it working perfectly last time you used it. May be as simple as an old fuse or a bit more serious, a leak in the Freon line. Good part is that diagnostics for this issue are pretty quick and most of the time you should have your cooling back in a matter of hours. We hear this very often from our clients and 8 times out of 10 it is caused by old and dirty air filters. In other cases however reasons can range from dirty or broken duct systems to bad blower motors and motor components. Will require thorough diagnostics by our technician to nail this one down. The good part is that the main system is working and all we have to do is sort the airflow. This is usually caused, but not limited to, running low on Freon. In this case it is best to turn of the unit completely until our technician is there to remedy the issue. This is usually a relatively easy fix but letting your compressor cycle on and off continuously may even damage it beyond repair if left unattended for too long. This is often a consequence of running your air conditioner too low with poor airflow mixed in. 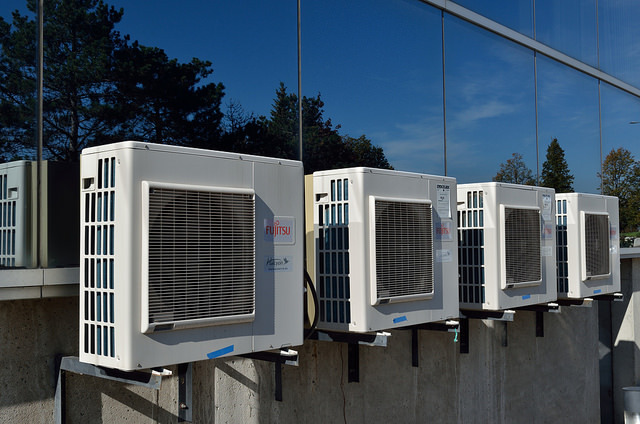 Turning off your air conditioner for the night and turning it back on in the morning usually temporarily remedies this issue but you definitely need an inspection and at least some maintenance done to your HVAC system. Continuously “defrosting” the unit and freezing it up again will eventually cause extensive damage where it can easily be avoided. A common problem with the drainage system of the unit happens when dust is allowed to collect and eventually clogs the pipes. Preventive maintenance is key to prevent this from happening but the issue itself is not a big one and can usually be remedied within an hour of our technicians’ arrival. Noise coming from either part of the unit is a sign that something went bad or is about to go bad. The sooner you reach out to diagnose this issue the better and may help you save a bunch on multiple parts that may get damaged by one single part. Just like a car, the sooner – the better. If your issue is not described in this list is probably because it doesn’t really fit any particular category. This doesn’t mean it’s a big problem however and we may be even able to diagnose it by phone. Feel free to call us yourself or hit the callback or email buttons for your free no obligation consultation. Hopefully this page is of help to you and next time you have HVAC air conditioning issues on your hands you will remember Heatwave Denver. Thank you.